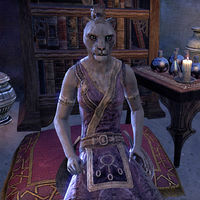 Hanubina-ko is a Khajiit mage who can be found in Kozanset. If you speak with her she can tell you about your star sign. If you ask Hanubina-ko to see what the stars tell her about you, her results will depend on your current Mundus Stone. "Ah. Come in, come in, walker! You have traveled far to see this one, yes? I know; you seek something lost. Hanubina-ko may help you find it. This one sees through mist and stone to speak with the moons and stars." What do my stars tell you? The Apprentice "This one sees … the arcane. Yes, Magrus dances on light blue paws—tiny flames and the scent of incense …." "The paw prints of arcana are difficult to track. This one sees … yes, it is the Apprentice that guides you. Impetuous. Prideful. You must be cautious. Know your limits, for none can see all ends." The Atronach "This one sees … strength. Yes. The clenched fist and walls of stone." "This one senses a heart of stone. Or is it ice? Ah, it is the Atronach that guides you. Sturdy, adaptable. Your sign grants you a steady arm and a nimble mind. You can be fire, stone, or ice. Adapt, but remain true to yourself." The Lady "This one hears the whispers of court—scheming and revelry behind closed doors …." "Your spirit bespeaks elegance, walker—pillow-soft and dagger-sharp. This one sees … yes, it is the Lady. Her gifts are sweet indeed for those deserving. Patience, caution, foresight. Seek the highest path to earn her protection." The Lord "This one hears the whispers of court—scheming and revelry behind closed doors …." "It is obscured by pride and hidden intent, but this one sees through that. It is the Lord that guides you—calculating, strong, ambitious, with the vigor of Alkosh. But be wary. Even the mightiest nobles can be felled by a flick of a quill." The Lover "This one hears the whispers of court—scheming and revelry behind closed doors …." "This one smells roses and lavender, hears laughter, quiet and demure. Ah, you bear the kiss of the Lover! All fall prey to your sleek charms, yes? Use this gift wisely, walker. To be loved and to be feared are different phases of the same moon." The Mage "This one sees … the arcane. Yes, Magrus dances on light blue paws—tiny flames and the scent of incense …." "Ah, yes … this one sees the flaming palm, the starry robe. It is the Mage that guides you. A fortuitous sign. As surely as Magrus sheds the sun's white light upon the hidden, if you seek out wonders … you shall find them." The Ritual "This one sees … the arcane. Yes, Magrus dances on light blue paws—tiny flames and the scent of incense …." "This one hears soft chanting, glimpses flickering candles. You are guided by the Ritual, yes? Allies shall seek you out, for your sign guides you to heal and mend. But beware—not all ills can be repaired." The Serpent "This one sees … a shadow. The flash of steel and fell whispers …." "This one sees writhing coils … silent menace. You walk with the Serpent. Your presence means danger for all, friend and foe alike. Sangiin has given you the gift of swift mending. Take care—venom is perilous to both poisoned and poisoner." The Shadow "This one sees … a shadow. The flash of steel and fell whispers …." "This one sees … nothing. A chill void. It must be the Shadow that guides you. Cold, cautious. Patient. Shadow is among the deepest signs, for it represents what is not known. Tread not too far down that path, walker, if you want to return." The Steed "This one sees … strength. Yes. The clenched fist and walls of stone." "This one hears the pounding of hooves, feels the straining of muscles. You are borne by the Steed, walker—headstrong and willful. Swiftness is a great gift, but only when measured with foresight. Do not rush headlong into danger." The Thief "This one sees … a shadow. The flash of steel and fell whispers …." "Hmm. Yes, your sign is well known to this one, for it dwells in the hearts of all Khajiit. You have the luck of the Thief…of Baan Dar. You are swift, cunning, and beautiful. Your dance brings wealth and risk. Just spare this one your touch." The Tower "This one sees … strength. Yes. The clenched fist and walls of stone." "This one sees claw marks upon cold, wet stone. Smells moss and memory. It is the Tower that guides you. Like a fortress, you may weather fire and claw. But do not rely on strength alone. The strongest wall is the one that is hidden." The Warrior "This one sees … strength. Yes. The clenched fist and walls of stone." "Hmm. Yes, your guide is difficult to miss. The Warrior. Straightforward, willful, brimming with wrath. Heed the counsel of Jone and Jode, walker. Without the little moon, the big one is left to spin alone, lost. Do not count on strength alone." This page was last modified on 18 March 2019, at 21:04.